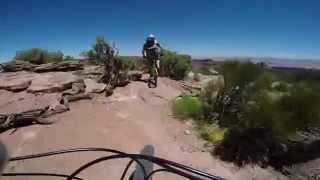 For those looking for a relatively mellow but rewarding cruise, this is hands-down the ride for you in Moab. It doesn't have much technical interest or major cardio workout, but the fast, fun trail and unbeatable and varied scenery are spectacular. Though not required, the counter-clockwise direction is suggested by the park and works very well. There are many ways to make this shorter, and many bail-out points, so if you're not sure about the distance, just start out and head back when you're getting tired. Start from the north end of the visitor's center parking lot on Intrepid, which is not special in itself, but it's a relatively fast and easy ride to the Colorado River Overlook. Expect a few small rock shelves from 2-6" in height that beginners might need to dismount in order to negotiate. From the overlook, join Great Pyramid, with several rocky ledges that might require dismounts. Otherwise this is an excellently-built trail with nice contours, rock plating where necessary, and great flow. Be sure to stop at the Pyramid Canyon Overlook. Continue on the Big Chief trail, with a few small technical hills to start with, and some interesting "alligator back" rock riding, you level out on the rim with MILES of amazing views. The trail is particularly fast and flowy, especially for desert riding. Continue out to the Big Chief Overlook with views of the potash mine 2,000' below (and all of Moab and the La Sal mountains). The trail then doubles back on itself on a higher level of the mesa. Great views continue, including good ones of the Henry mountains to the west. You could take Raven Roll back to the car from here if you're in a hurry. Otherwise, take Crossroads, which is dead flat and uninteresting until you cross the road. On the western side of the road, the trail gets much more interesting as it winds through juniper, sage, and Mormon tea plants. Look out for some sandy corners or you could lose your front wheel if you're going too fast. Next you're on Whiptail, on the top of the mesa with kind of generic desert riding until you get to the rim. Now the views are spectacular and trail becomes a fun roller coaster ride among small rock formations. Smooth and flowing, this is an example of some of the finest new-school trail-building around. Note you can cut this trail off short by taking Prickly, but you'll miss all the fun parts. The trail ends in Prickly (the shortcut came in from the left, but you'll go right). This trail lacks the stellar overlooks of other trails, but it has cool rock formations such as ledges and caves that you can ride around. There are a couple short sandy sections. Take this back to Intrepid and a quick return to your car! Absolutely gorgeous ride! Well marked and maintained as well. Impossible to get lost. Awesome trail! Epic scenery a perfect intro to Moab’s mtb terrain. Do it counter clockwise for a nice progression from easy to intermediate. Nice trail system. Easy enough for most beginners and some techy spots for intermediates to practice skills, all with incredible scenery. Biked into the park. Rode loop to the visitor center. Hiked 3 miles r/t to the point. Ate lunch at VC. Finished loop and biked back to the car. Fantastic, just a great loop. Great mix of fun features and also plenty of flowy singletrack. Intrepid to Raven To ? Amazing scenery, quiet trail, really great ride. Greg and Cee in the mix. Cee rode the Giant Anthem and loved it. She felt a lot of confidence on this trail and is now hooked. Thanks, Moab! This trail is littered with epic views! Showing others how it's done at Dead Horse Point. Passing by Big Chief on Whiptail. Scenic views along Twisted Tree. The Dead Horse Point Tour video. Flowy singletrack with great views. Group pic at the trailhead before our ride.